(1854-1937) Born in Ogdenburg, Germany, Henry Raschen became one of America's leading painters of Indian portraits and figures in the 19th and early 20th centuries and was the first California artist to be committed to Indian themes. He also painted still lifes and landscapes, the latter with skillful play of light and shadow. In 1868, he and his family emigrated to Fort Ross, California and then settled in San Francisco. He took early art lessons at the San Francisco Art Association under Charles Nahl and Virgil Williams. Raschen went to Munich in the late 1870s and became part of the numerous California artists then studying in Munich at that time. 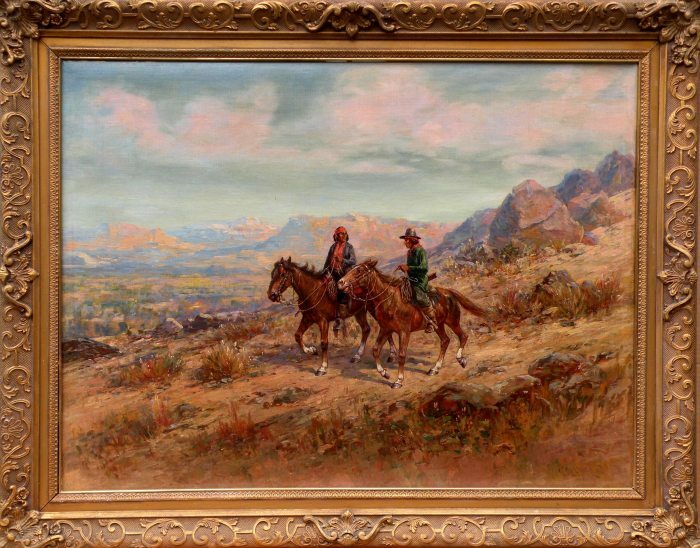 There he became friends and a painting companion of William Merritt Chase.In 1883, he settled in San Francisco and for the next eight years went with landscape painter Carl Von Perbandt on excursions among Indian tribes of California and the Southwest.He went on an expedition with Army General Nelson A. Miles when Miles and his troops captured Apache Chief Geronimo at Skeleton Canyon, Arizona. Many years later in Oklahoma, Raschen sketched Geronimo whom he visited in prison at Fort Sill. In the early 20th century, a key person in establishing Raschen as a major artist in San Francisco was Mrs. Phoebe Hearst, mother of publisher William Randolph Hearst. In 1906, damage from the earthquake and fire caused him to move across the bay to Oakland where he painted until his death in 1937.